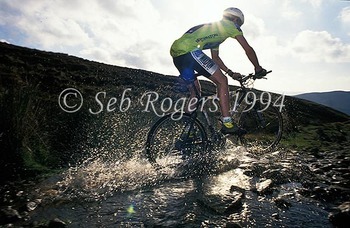 It was the first time I'd gone out to shoot something specifically for a mag - a route guide for Cycling Plus. I spent the better part of a late autumn day on the most scenic sections of the route with a friend of a friend from Manchester (whose name, I'm ashamed to admit, I've long since forgotten) and a 35 litre rucksack full of spare layers and all the camera kit I owned at the time (one body, three lenses, a single flashgun). 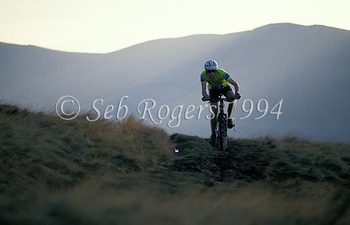 - full lycra and a hardtail... not something you see all that often now. Anyone who's been riding for a while will spot the Bonty hardtail, Mint Sauce helmet stickers and toe clips and straps. The eastomer-sprung RockShox Quadra 21 forks were cutting edge (and rubbish), too. Keith Bontrager, Mint and RockShox are still going strong. My old toe straps now help tie the bike to the roof rack. 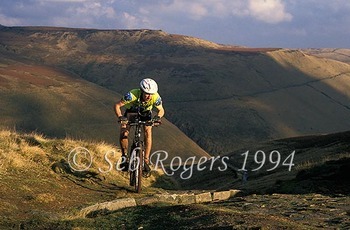 - we picked the best bits of trail, I set up a shot and it was re-ridden until I was happy I'd got what I wanted. I still do that. - I didn't worry too much about the direction of travel. If a shot worked better riding the route the 'wrong' way round, that's the way we shot it. I still do that, too (I'm aware that some purists think this is somehow misleading, but I'm ******ed if I'm going to pass up a great shot because the rider's pointing in the 'wrong' direction). - I focussed manually, beacuse I had no choice - the F801's AF was laughably slow and completely incapable of tracking anything that moved. Despite owning cameras with cutting-edge AF now, I still focus manually most of the time, too. - I set the exposure manually, after years of habit. Hey, guess what...? - I still have the F801 with which I shot these pics, but in the intervening period I've got through a frankly obscene number of camera bodies: a second F801, an F90X, an F80, an F100, two F5s and a D100. I also still have one of my F5s and an F6, plus my D40X, D200 and D2X. All told, that's a body a year. Eek. Seems old habits die hard, eh? Here's a shot that I really like that never made the cut. In fact, the entire shoot was re-scheduled after an epic struggle with sticky, clay-like soil and bad weather meant that we just didn't get enough pictures for a feature. We all had to go back another day and do the whole thing all over again. Back in the late '90s team Animal was a force to be reckoned with - and Tim Ponting was their secret weapon. Quietly spoken and unassuming, his riding was aggressive but oh-so-smooth, pushing his sub-4 inch travel Giant into places it really shouldn't be. I like the look of concentration in his eyes and the reaction from the riders gathered at the bottom of the wall, and I always thought it was a shame this pic was never used. It's also interesting for all the little details that show how much things have changed. Tim's bike would barely make the grade as a cross-country trail machine now, and no self-respecting freerider would be seen in public wearing tights. The move he's pulling isn't all that aggressive by current standards either, although I have the feeling that if the ground hadn't been so claggy he'd have got another few inches and pushed the bike a bit flatter. I'm not the kind of person to court controversy, on the whole. Heck, I drive a seven year old diesel Skoda estate and would happily keep my money under the mattress if I could find one that paid enough interest. Seb's the name, sensible's the game. Must be getting old. This shot was one of the last I took, after a nearly two hour wait halfway down the descent for the sun to appear below a stubborn ridge of cloud on the horizon. The scree became so steep and the rocks so large beyond this point that we were reduced to walking again, and by the time we reached the bottom the sun had dipped well below the horizon. Not at all. Rob's one of the most level-headed and skilled bike handlers I know, so I was confident he wouldn't take unnecessary risks. As an experienced climber he also knew the route we were taking inside out. And we brought along his army-trained climbing partner with ropes, harnesses, survival gear and the kitchen sink, just in case. Safety was our primary concern. A matter of opinion. 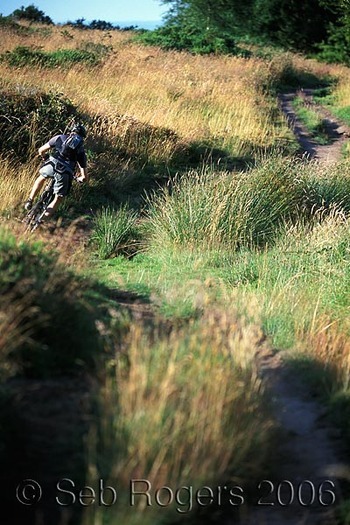 In circles for whom mountain biking is the devil's work, it simply confirmed old prejudices. Looked at objectively, it's freeriding. For the rest of the population, it's just a mountain bike being ridden in the mountains. Not really. The scree slope Rob rode is a frequently used access route for climbers. Rolling through it on a bike caused no more damage than walking up (or down) it in a pair of size 10 walking boots - something that happens hundreds of times through the course of a year. Debatable. 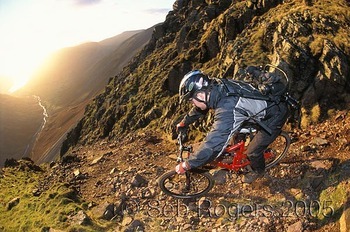 Anyone wanting to copy Rob would have to dismantle their bike, carry it to the top of a 3000 foot mountain, scramble down an unmarked gully and reassemble it before riding down a frankly terrifyingly steep, rubble-strewn slope. It's hard to see how anyone would think it's a good idea, let alone worth the effort. Well, that's it. I'm off for another Christmas of eating and drinking more than I should, trying not to offend any of the extended family and attempting to squeeze in a short ride or two. Just like most other mountain bikers, then. Freeride's 10. And a bit. Veteran freerider Richie Schley's move to Rotwild after 10 years with Rocky Mountain (who, incidentally, have the coolest URL in the entire bike industry) reminded me of this picture from 1999. In 1999 the original 'Froride* lineup of Schley, Wade Simmons and Brett Tippie had been around just long enough to raise more than a few industry eyebrows, help bring the original North Shore both fame and notoriety and start a whole new mini-industry centred around riding bikes where they had no place being (in mid-air, mostly). Most of the bike industry was unprepared, much of it was sceptical and some of it was outright hostile to the idea of of riders piloting bikes anywhere they damn well pleased. But the 'Froriders' easy-going nature made them a pleasure to work with, back in the days before freeride was a media circus and Kranked was little more than a mis-spelled word. Richie Schley shares the credit with his 'Fro team-mates for helping to put freeride - and BC - well and truly on the bike industry map. * The 'Froride name, in case anyone's wondering, resulted from a well known bike company (who claimed to have trademarked the word 'freeride') threatening Rocky Mountain with a lawsuit. Neatly sidestepping a protracted court battle, RM simply changed the name of their team to 'Froride, provided Schley and co. with some comedy afro wigs to wear at events, and got themselves a heap of good-humoured publicity into the bargain. A very Canadian response, eh.